Donkeys are covered with hair, usually grey to brown in color. They have very long ears and very loud voices. They have very powerful back legs and when they feel that they need to protect themselves, they use them to kick. Most donkeys live on farms or as pets. Those few who do live in the wild are found mostly in Africa. Descendants of donkeys who used to live in captivity but were turned lose with the coming of the steam trains live in herds in the Southwestern part of the United States. Donkeys eat grass, grain and hay. When they live in captivity, they also like to eat table scraps. 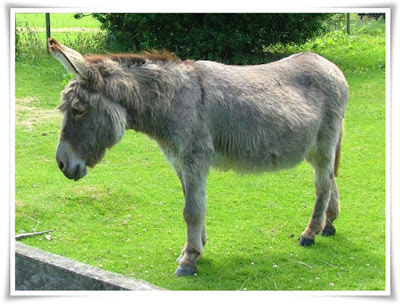 Most donkeys are found living on farms in barns and stables. Those that live in the wild are found living in herds with other donkeys. Donkeys like to be around humans. Gold prospectors liked to use donkeys as pack animals because they didn’t have to lead them with reins, the donkey would follow them wherever they went. The donkey has been used as a working animal for at least 5000 years. Donkeys are sometimes used as guard animals for sheep. They will protect them from wild enemies such as wolves.